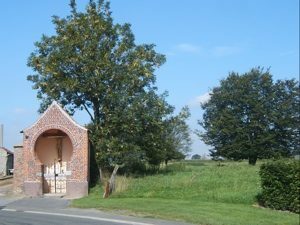 Located in the village of Braffe, in the district of Péruwelz, the gîte is at about 100 metres of the ‘Gros Tilleul’, a hundreds years old tree (unfortunately really damage), listed in the catalogue of the remarkable trees of Belgium. The village is in the heart of Western Hainaut, in a region of large farming and rearing. The district of Péruwelz is well known for its numerous springs and moist zones. It’s along the French border.